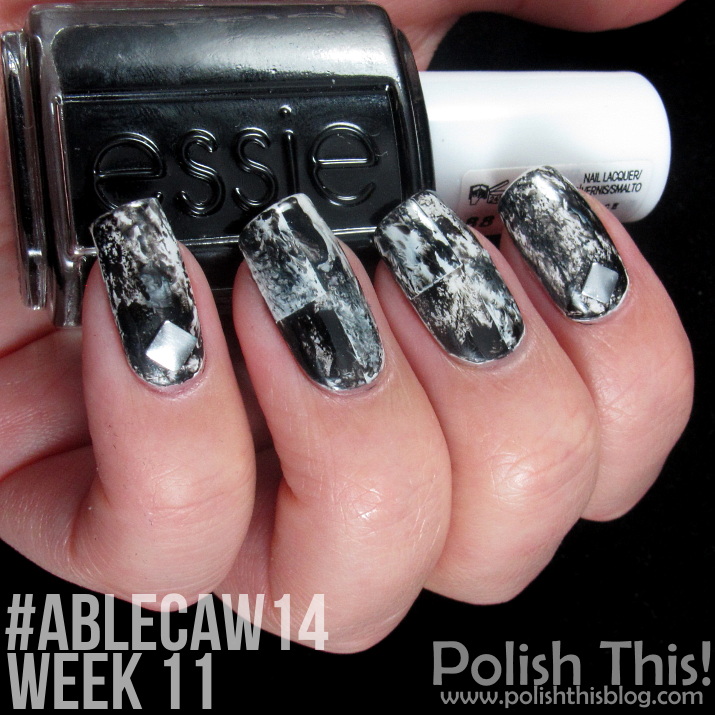 #ablecaw14 Week 11: Black & White - Polish This! Another week, another #ablecaw14 manicure! I can't believe we have only so few weeks left of this challenge, at least there are still some pretty great themes ahead. This week the two themes are Winter Wonderland and Black & White, and I decided to do the black and white first. 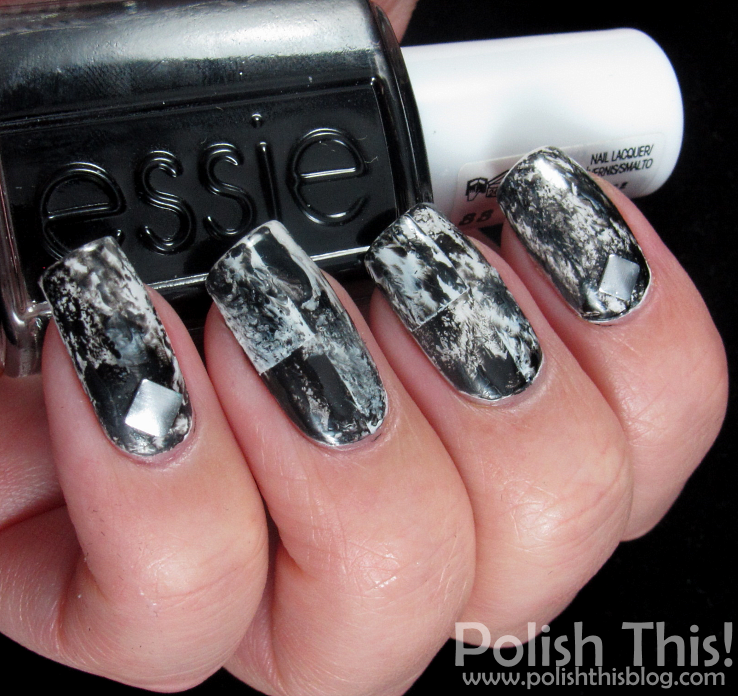 I've had this idea for this black and white manicure for quite a while and finally got to do it. I'm not 100 percent sure if I got this totally right, but at least I tried... I think it might not be too obvious, but my inspiration for this manicure was a kind of marble floor tiles, obviously black and white marble floor tiles. That's why I have those squares going on on my middle and ring fingers. I should have made the contrast a bit bigger between those different "tiles", but I liked this manicure quite a bit anyhow. I used OPI Anglen With a Leadfoot as my white polish and Essie Licorice as my black. I first painted one coat with the white and let that dry. Then I did a second white coat and when it was still wet I added couple drops of the black polish and did the marble look with a technique that was kind of a mix between watercolor nails technique and saran wrap technique. I also added some metal nail art studs on my thumb, index and pinky nails. When my middle and ring finger nails were completely dry I taped them with nail vinyls and did another marble those two squares on each nail. I don't really do black and white manicures too often, so this was really refreshing. It's very cool look, I should use it more! How about you guys, do you like black and white nails or nail art? Aivan käsittämättömän upeat! Lakkasit siis eka koko kynnen valkoiseksi ja sen päälle mustalla koko kynnen kuviointi. Sitten vinyylit neliöiksi kulmittain ja sitten...? Lakkasitko taas ensin valkoisella ja sen päälle mustalla uudet kuviot? Tyhmä ei tajua :). Kiitos verbaalitutoriaalista :). Nyt tämäkin tajusi. Pakko testata!!! Ihan ku lakritsijäätelö! :P Upeat! Upeat, ihankuin joku marmorilaatta. :) Vau!